In Visual Studio 2013 the Server Objects and Events drop-downs are disabled from displaying by default. In past versions of Visual Studio, the drop-downs were enabled, so developers who are expecting to see them when they first boot up Visual Studio 2013 may be surprised. Maybe Microsoft got complaints from developers about these drop-down lists taking up too much screen real-estate, and so set them to hidden by default. I personally find them useful enough to justify the extra space that they take up. Either way, it’s useful to know how to enable or disable the Server Objects and Events drop-downs based on your particular development preferences. When in your Visual Studio project, click on the Tools menu option on the top bar. You will see a Check Box labelled Navigation bar. Check this Check Box and click OK to apply your changes. 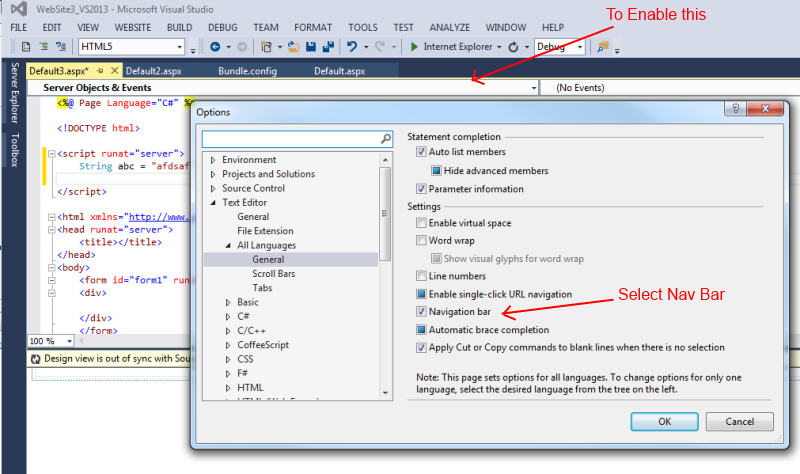 In the Settings pane for C# you can now un-check the Navigation Bar option. This will ensure that you do not see the Server Objects and Events drop-downs when you are working with C# code. Tip: Press Control-F2 while coding to jump to highlight the Server Objects and Events drop-down. You can then select the object you are interested in using the up/down arrow keys, followed by the Tab key to jump to the event that you want to assign, and then click the Enter key to have Visual Studio auto-generate your new method. I am impressed with the extensive customizability of Visual Studio, although the sheer extent of the options can be confusing at times. The settings in this article is one example of the level of detail that the Visual Studio development environment gives you to manage your preferences. Is it disable in code behind by default in VS 2013? Hi, yes both drop downs were disabled for me in both code behind and inline code, so I had to manually re-enable them. I find the Visual Studio – Client Objects & Events drop down list to be helpful. I also find the concept of a bold font for events that have actual code segments very useful. Since I use the bold font as way to quickly jump to a desired location it would be great if the sort order for the drop list could be all of the bold font items first. I have not located a way to configure this. Does anyone know if it exists or how to turn it on?